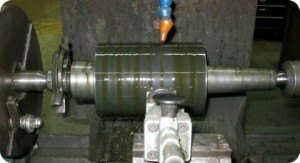 A&A Company offers a full, turn-key thermal spray coating service which includes Finish Grinding, Machining & Polishing. Take the guess work out of grinding our coatings, leave it to the experts. 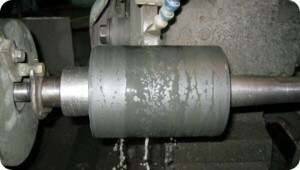 Wet grinding is preferable to dry grinding and should be used whenever suitable equipment is available. It presents no difficutlties provided the right wheels are used, at recommended speeds and feeds. Many customers have experienced considerable difficulty finish grinding due to lack of experience with sprayed coatings. This is mostly a result of the different wheels and procedures that are required to grind sprayed coatings. All sprayed metals tend to “load” a wheel. Consequently, for grinding sprayed metal a wheel of relatively coarse grain and low bond strength is necessary in order that it may “break down” with comparative ease. A wheel suitable for finish grinding solid metal steel will produce chatter marks and sprals on sprayed metal unless it is dressed with great frequency. The same characteristic applies to all other sprayed coatings. A classic grinding wheel operator will tend to use the grain and grade wheel that he is accustomed to use on the same material in wrought form, and he will find that regardless of the manner in which he dresses the wheel it will load up immediately and produce a spiralled and discolored surface. If he continues and attempts to remove stock with a loaded or glazed wheel, he will end up with surface checks that cannot be removed. As such, A&A company offers a full, turn key thermal spray coating service which includes Finish Grinding. Take the guess work out of finishing our coatings, leave it to the experts. After a cylindrical component had been undercut and sprayed, a finish machining step is necessary to bring the component within the defined diametrical tolerance. Finish machining is employed when a fine surface finish is not required, typically on sprayed metals. Ceramics and carbides must be finish ground. The machinist unfamiliar with sprayed coatings will grind his tool bit and set it according to his past experience on similar metal in its solid or wrought form. As a result, crumbly chips similar to those from cast iron will be obtained, regardless of the metal or the tool setting, and the surface obtained will appear full of “pin holes” and will appear decidedly porous. As such, A&A Company offers a full turn-key thermal spray coating service which includes Finish Machining. Take the guess work out of machining our coatings, leave it to the experts. Finish polishing is necessary to meet surface finish requirements that can not be achieved by machining or grinding. Actual achievable surface finishes depend on material and are defined on individual material technical bulletins. Polishing of sprayed metal requires no special skill as long as the operator has the experience and understanding that the material is not a solid piece of metal, but a thin veneer which is bonded to the base metal mechanically and not by fusion. Due to this requisite experience, A&A Company offers a full turn-key thermal spray coating service which includes Finish Polishing.